As a cake pop enthusiast, it makes my heart swell with glee when one of my ‘friends in the biz’ opens a cake pop store. And it’s even more humbling when that store is outfitted with KC Bakes Mega Cake Pop Stands! I’m so excited to share with you, the grand opening of… Fabipops! To celebrate, we’re doing a special Wednesday edition of “Meet Me Monday”, so you can get to know Fabiola’s incredible story. Check out her Fabipops Menu and official Press Release, too! The Brooklyn Paper also wrote a very nice piece on FabiPops as well (read it here). Congrats Fabiola, wishing you great success! Business Name: Fabipops…its s a piece of cake! 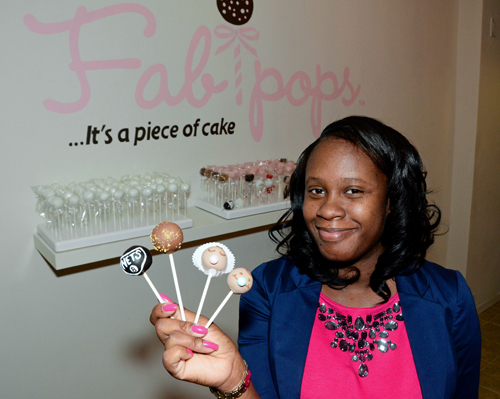 When & how did you become a cake pop maker? 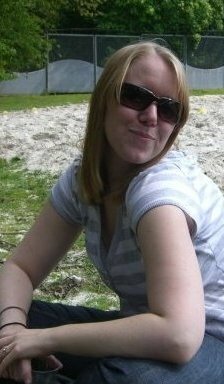 February 2011, after the death of my infant son. I baked cake pops as a means to cope with his loss. Baking has been very therapeutic for me. Do you bake as your full-time job? If yes, how do you enjoy it? Not currently, I still hold a full time job; however I will be resigning from corporate America to manage my store full time. What inspires you in your baking; how do you come up with original ideas? Anything and everything inspires me, I simply like to challenge myself with new designs and characters. What are some of your favorite cake pops that you have made? My Fabipoparazzi cake pops have been my absolute favorites, sometimes I still can’t believe how lifelike they look. What advice do you have for other cake pop makers? My advice to other cake poppers is once you have the basics down, just have fun! Do you make anything else in addition to cake pops? I also make Push up cake pops, cake pop truffles, ring pops, cupcakes, and French Macarons. If you could have any super power, what would it be, and why? I would love the power to heal. Watching my son pass away in my arms is reason enough. What area do you serve/sell to? NY Tristate area, and the U.S.
Do you ship your cake pops? Yes, we ship and deliver. What’s the best way for people to order from you? Call us at 347-480-POPS or email us. 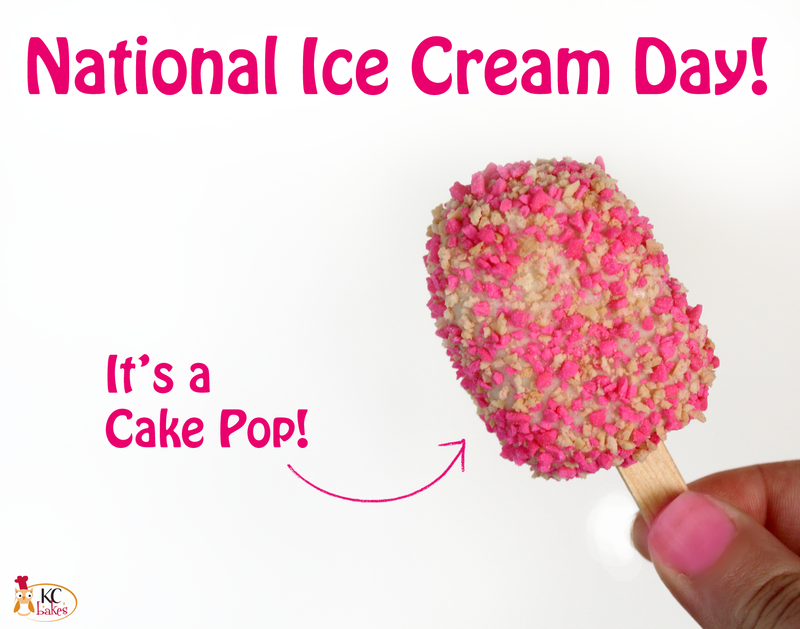 Today is National Ice Cream Day! Did you know such an amazing holiday even existed? I only discovered it a few weeks ago, and it will now be on my calendar every year in the future. To celebrate this wonderful day, a group of us bloggers decided to make ice cream inspired cake pops – “cake and ice cream” go together like peas & carrots, but taste WAY better! Be sure to read all the way to the end of this post to see their creations as well. 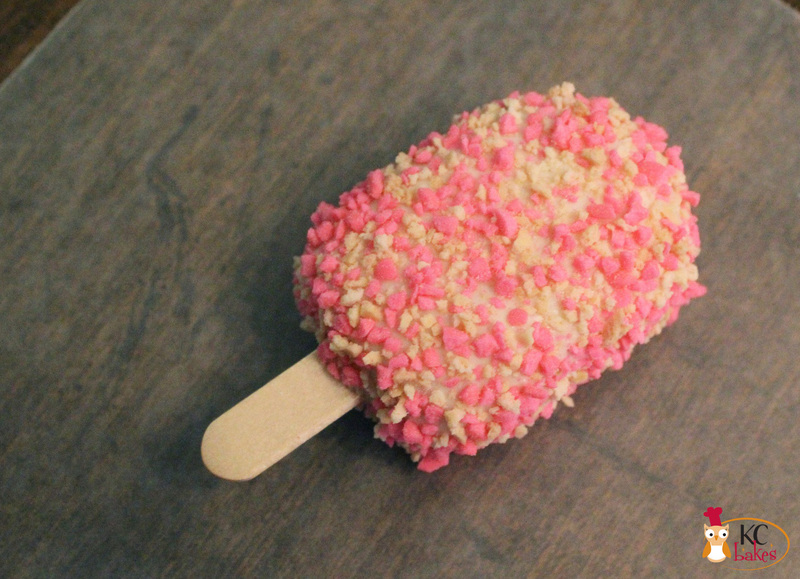 I saw ice cream sandwich cookie wafers at my local Amish Market recently, and thought they would make a fun cake pop idea. I bought them in chocolate and vanilla, but after getting home, it just wasn’t working out how I planned. I got to thinking… what is my all-time favorite ice cream treat? Good Humor Strawberry Shortcake Bars! Oh my gosh, I absolutely love them, the perfect summer treat. 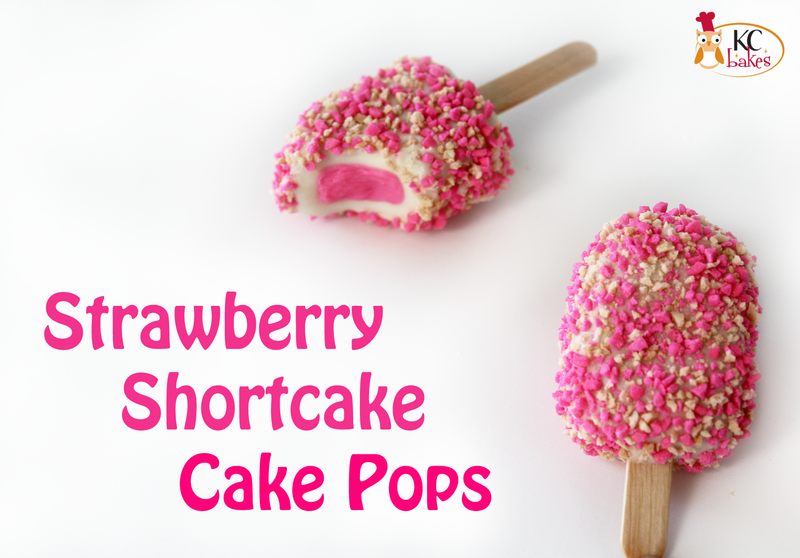 So, ladies and gents, I give you… *drum roll* Strawberry Shortcake Cake Pops! To get started, we need to prepare the crunchy coating. 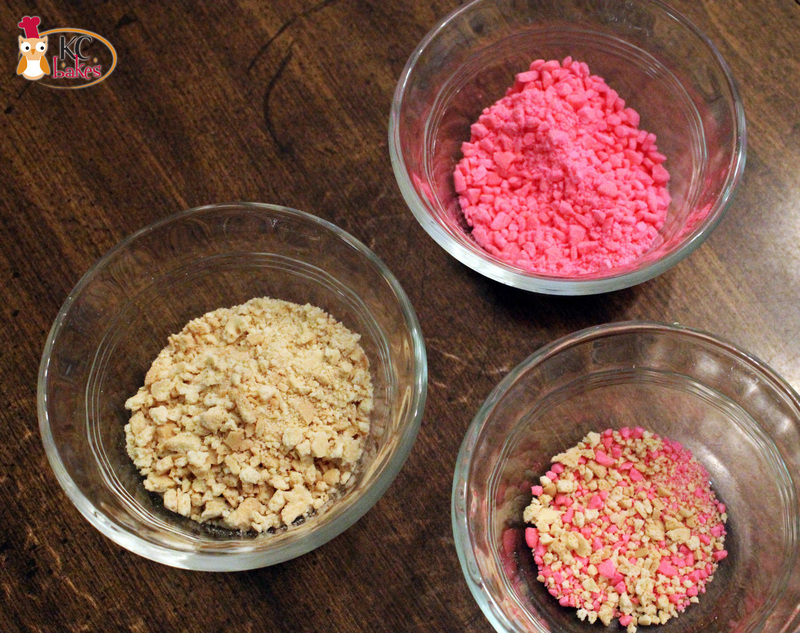 For the pink, I crushed heart sprinkles, and for the cream color, I used the vanilla cookie wafers (they came in handy after all!). Place the items in separate Ziploc bags and smash away. The pieces should be pretty small, but don’t smash them so much that it turns into powder. 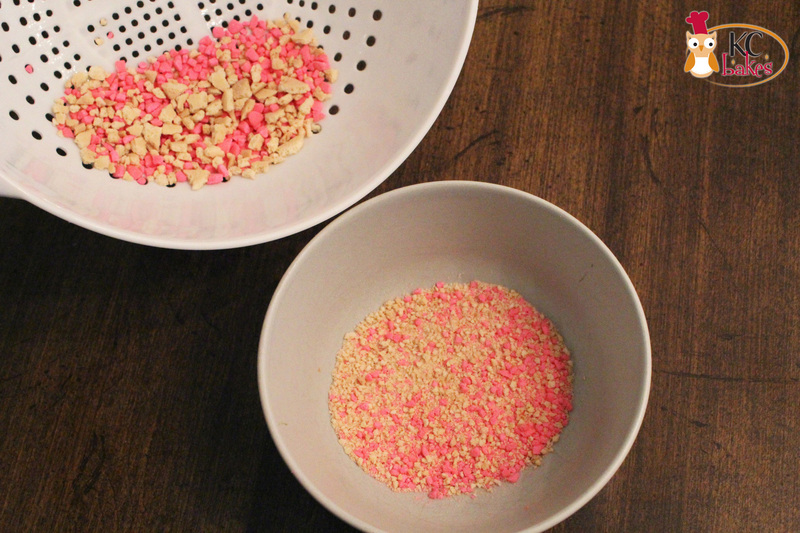 Combine the crumbs in equal parts into a 3rd dish. As you can see, the pieces vary in size. To get a more uniform consistency, I sifted my mixture through a colander. Now for the cake pops. Prepare your cake pop mixture as normal; if you need tips on cake pop basics, click here. Instead of rolling them into balls, form them into these tombstone-like shapes. 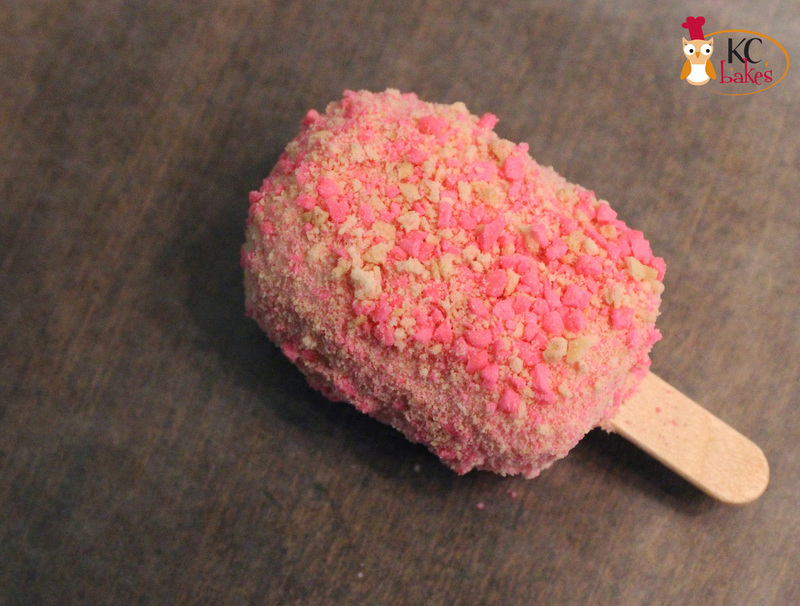 I didn’t think this far ahead… but to make authentic Strawberry Shortcake Cake Pops, use strawberry cake and frosting for the pops! 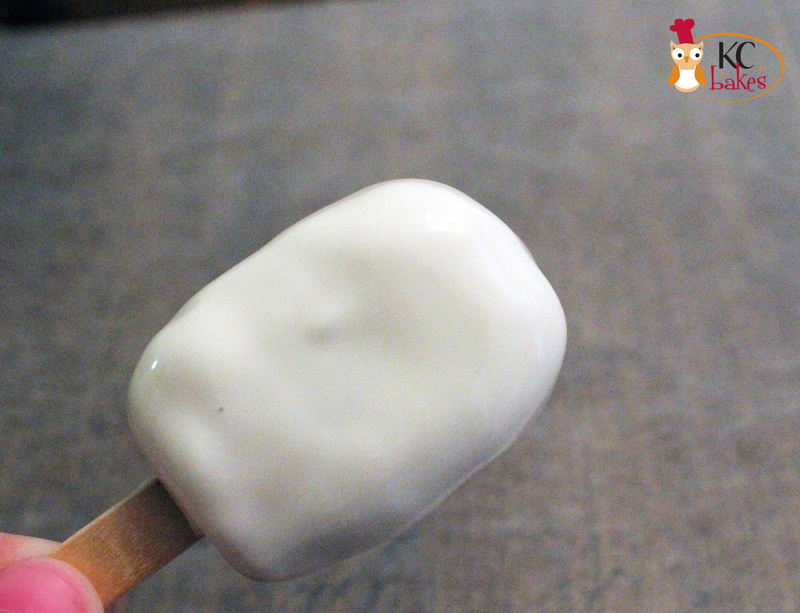 Dip each popsicle stick in melted chocolate, then insert into the bottom of the cake pop. Chill these in the refrigerator for about 10 minutes. Since its warm weather, only bring a few pops out at a time. If they get too warm, they’ll soften up and fall off the stick when dipped. 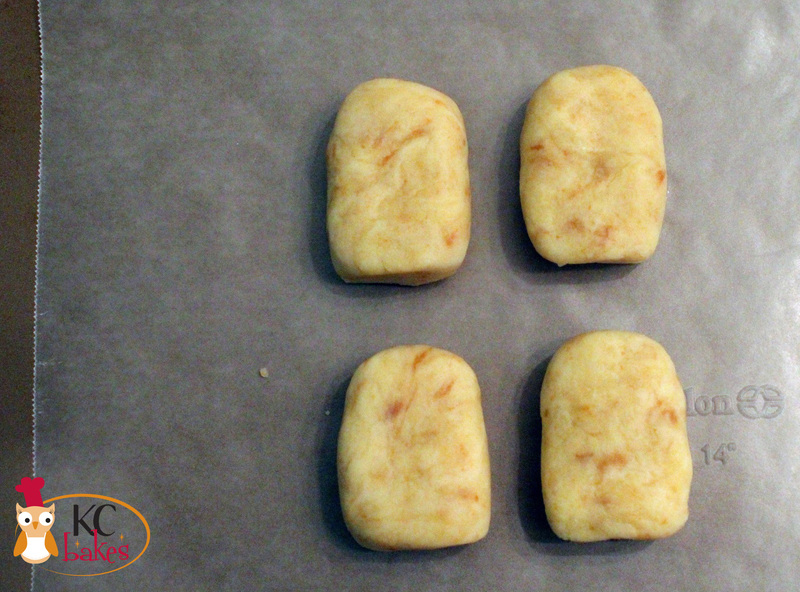 Immediately after dipping each pop, coat with the crunchy mixture. Here’s where I ran into a bit of a snag. See the sides of the cake pop – the fine powder part of the mixture stuck to the melted chocolate first, and my bigger pieces weren’t sticking. It just wasn’t looking like the real thing. Then I remembered I had a fine wire sieve! 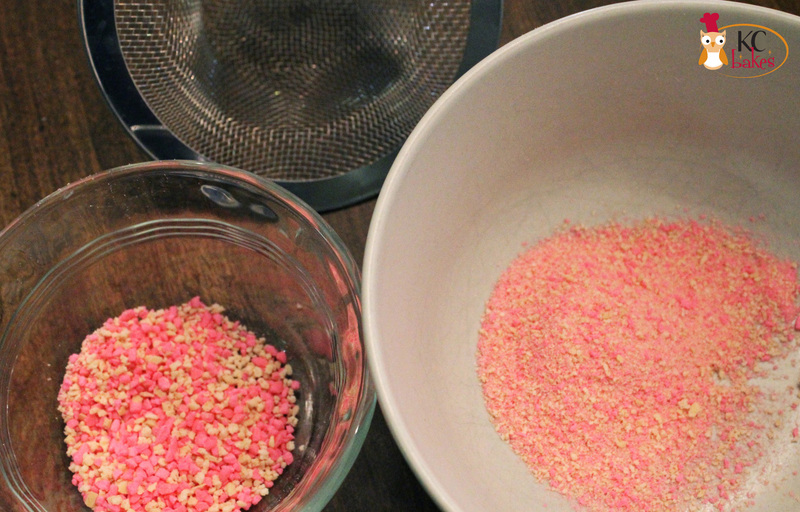 I poured my sprinkle mixture through the sieve, and all of the fine powder fell into the bowl, leaving me just the crunchies. Ta da – much better! As you saw, the inside is pure cake pop. If you want to make your pops with the bite taken out (as shown in the first picture of this post), check out how I did it in my Orange Creamsicle Cake Pop Post. Its the same technique – just be careful not to get the crunchies in the “bite area”. Use pink melted chocolate for that inner strawberry look… it really fakes people out! Think you can handle MORE ice cream? 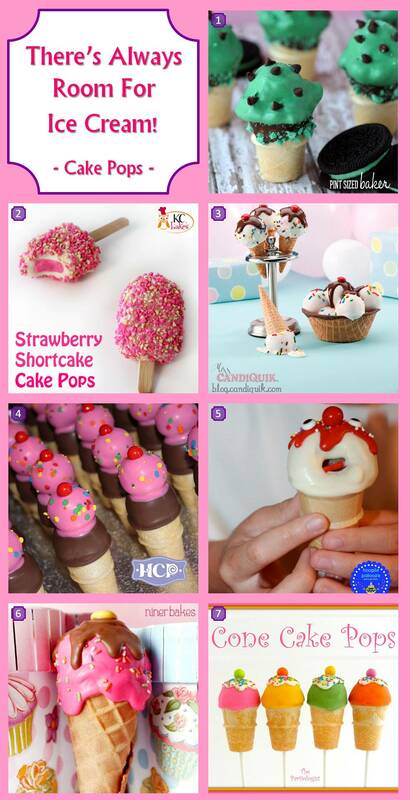 Check out these awesome cake pop ideas from my fellow bloggers. July is National Ice Cream Month, so you have plenty of time to celebrate with these super fun ideas! I have years of experience in Marketing and Graphic Design, which has come in really handy in the current small business that my husband and I own. When & how did you become a cake pop maker? My addiction to sweets began with a batch of obese looking gingerbread men that I made one Christmas. Despite the fact that the cookies were seriously lacking in the beauty department, they were a big hit. That’s all it took to get me interested in the world of sugar art! I started with decorated sugar cookies and then began experimenting with cake pops. Many hours filled with baking, decorating, and photographing followed. Do you bake as your full-time job? No. I work full-time at a sign and graphic business that my husband and I own. 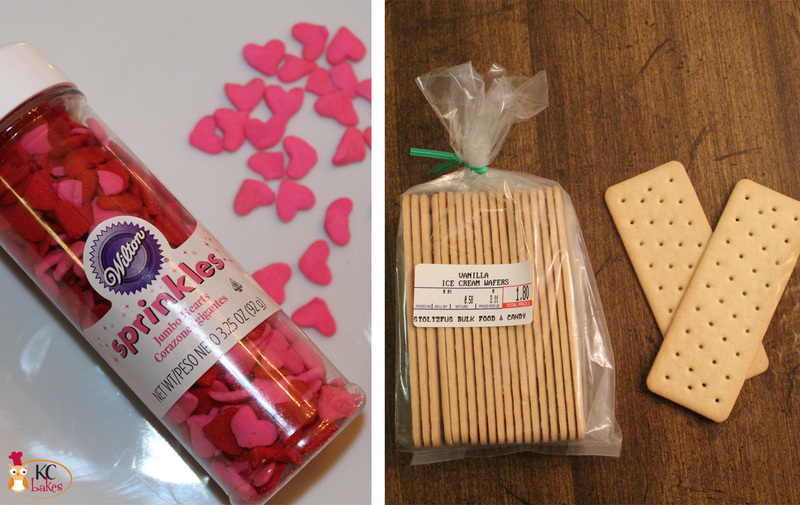 What inspires you in your baking; how do you come up with original ideas? I get most of my inspiration from the things in life that I love. Whether it’s an adored pet or a game I enjoy playing, it’s a lot of fun to create sweet treats that remind me of my favorite things. When I am making a treat for someone else, I try to do the same thing and focus on what they love. What are some of your favorite cake pops that you have made? Practice, practice, practice. How cake pops turn out has a lot to do with temperature. The more you work with them, they easier it is to know when something is too hot or too cold. I also love to decorate sugar cookies! I have fun experimenting with all different kinds of sweets but cake pops and cookies are my favorite. Favorite TV show or movie: Right now I’m lovin’ Game of Thrones and I can’t wait till Breaking Bad is back on. Favorite candy: Jelly Belly jellybeans! Yum! If you could have any super power, what would it be, and why? I would love to be able to fly. Seriously, how cool would that be? Plus, no more rush hour traffic! I’m originally from London, England, and a few moves around, I have found myself in Orange County CA. When I graduated from University, my hubby and I moved to Paris, France for work and that’s where I discovered my love of baking. Whilst we were there, it was purely a hobby; when we moved to CA in 2010, I decided to get turn the hobby into a blog and a business. It was all a little by accident. I’d been making cupcakes for a little while, and while cruising Amazon for a birthday gift idea, I found ‘CakePops’ by Bakerella. I ordered the book on a whim. A few weeks later in early 2011, the animal shelter I volunteered at was having a bake sale, and I thought it would be super cute to make puppy and kitten cake pops. They were an interesting one to start with, but from there my love of them started! I wish! Actually, that is not true, as much as I love baking, I love my full time job too. I have always had a passion for helping animals, and so full-time, I work as a Veterinary Assistant for a small Animal Clinic. It can be long tough days, and some days are harder than others, but its very rewarding. Do it because you enjoy doing it – not to make money or to ‘get famous’. I love what I do, or I wouldn’t be doing it, and I think you can really tell when people are making cakes/cake pops/cupcakes simply for the financial benefits. Yes! I also make Cakes, Cupcakes, Cookies and Candies. I also just started making Macrons too – I miss them so much from my days back in France! Favorite TV show or movie: I was a HUGE ‘Friends’ fan when I was younger, and still love it! Which means I also love ‘How I Met Your Mother’? Favorite book: Tina Feys – ‘BossyPants’ I just finished it recently and I love her even more than I did before. Favorite candy: Mint Aero Bars – or anything from the UK really. If you could have any super power, what would it be, and why? To pause time – for no other reason than I could sneak a nap in every now and then! Do you ship your cake pops? Not yet, but its definitely something I’m researching for the future! I became a cake pop maker after experimenting with new recipes using CandiQuik Coatings…then I became obsessed with them! 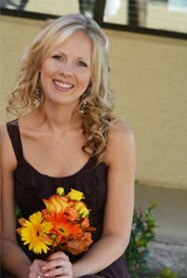 I am the marketing director, blogger, and recipe developer for CandiQuik Coatings – love it! It is difficult to come up with original ideas as there are sooo many creative minds out there! Usually I will see something (not even necessarily food related) and then my mind will start running. For example, my Pinocchio cake pops, which were inspired by a pencil sharpener! Pinterest is also a huge inspirational site where you can find ideas and expand on them! If you think cake pops are difficult, just keep trying, practice makes perfect. Read the many tutorials out there offered by other bloggers and don’t give up! Yes! Everything dessert for my blog. Favorite TV show or movie: I’m not a TV show person. But Homeland, seriously addicted. Favorite non-baking hobby: Horseback riding! Favorite celebrity: I don’t really have one…but I think Ellen is hilarious and Will Smith is super talented ;). Blogger wise, love Pioneer Woman. If you could have any super power, what would it be, and why? To fly! Cliché, I know.